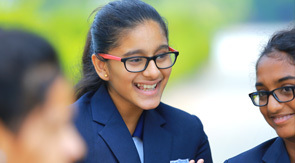 "We at Manchester International School are very proud to introduce you to this tantalizing glimpse of the purposeful and varied life at our school. Our aim is to guide each individual towards a confident, resourceful, independent and happy adulthood well qualified in every way. If you share that vision for your child, this is the school for you"
We are an institute which offers a broad and balanced education- academic, artistic, practical and physical – so that all our students can fully explore talents and interests in their formative years. Our dedicated teachers, for whom teaching is a passion, enthuse and challenge the students to full extent, this rewarding work combines both hard work and fun; they support students while gradually teaching them the skills to learn from each other and to study independently. We are also an inclusive school, where every pupil is equally important to us. Over here the balance of learning support, physical development and pastoral care is tailored to the needs of the individual child. Sport, Music, Art and Drama are all renowned strengths of the school, and a glance at our term calendar reveals the wealth of activities, trips and events which provide so many opportunities for our students to shine. We lead each of them, not only to achieve their highest academic potential but also to enjoy learning itself: that is what makes an alert, ambitious and resilient person who can thrive and prosper in tomorrow’s world. Everyone has the chance to pursue passions, to participate, to be part of a group: to develop confident relationships but to be unique. The relaxed, warm and unpretentious atmosphere of our diverse, vibrant community will strike you immediately. We stress courtesy, concern and respect for all the members of our school. To see why children come from such a wide area, visit us and meet our staff and talk to our students – They are our best advertisement.